1. The folks who made this list were those I didn’t know much about before going to the show. I might have heard of them, but didn’t know of them like I do Richard Sachs, who was at the first NAHBS, and has such a long, celebrated reputation, that even I know about him. 2. The folks who made this list were not necessarily those with the most amazing craftsmanship. 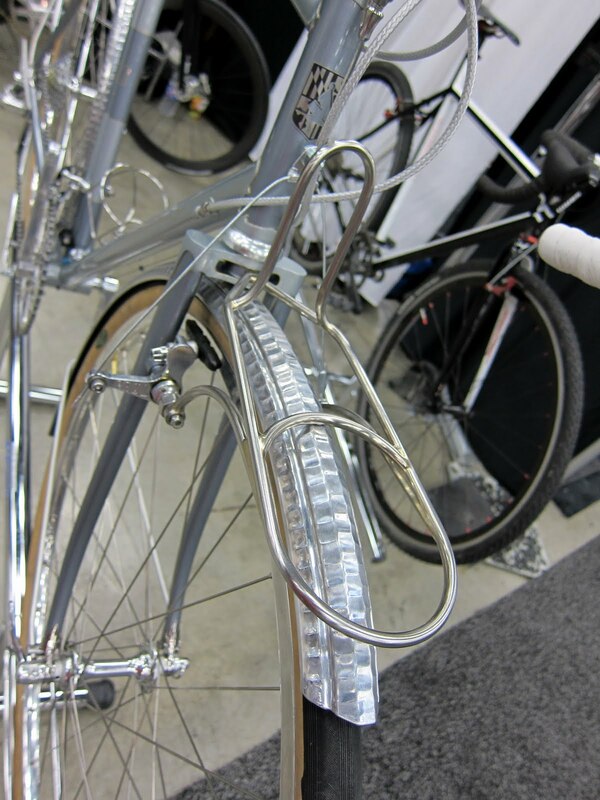 There are some very impressive “art bikes” that evidently have hours upon hours of work in them. These are included because they have MY optimal blend of art/craftsmanship/function. As you will see, even MY optimal blend moves around a bit. 3. 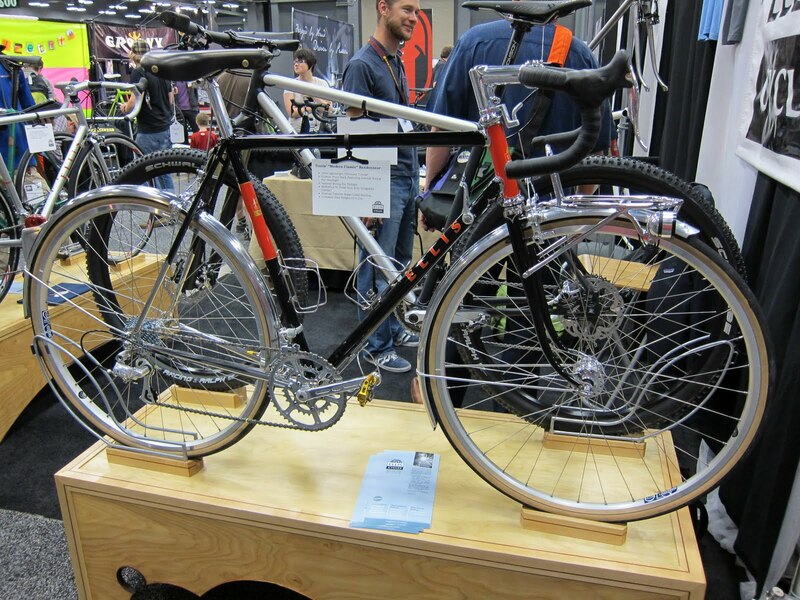 I tended to not spend much time around carbon fiber bikes or mountain bikes. I’ll admit that the folks over at Black Sheep Bikes had some pretty impressive machines, but I just couldn’t picture myself with one. Again, plenty of excellent examples in these categories. Just not what I kept going back to a third or fourth time to admire. So with all that for introduction, let’s take a look at a few impressive machines. These guys push my limits of “art bike”, but they touched an aesthetic nerve in me somewhere, so they made the list. They’re simple, clean, but appear to be reasonably functional. 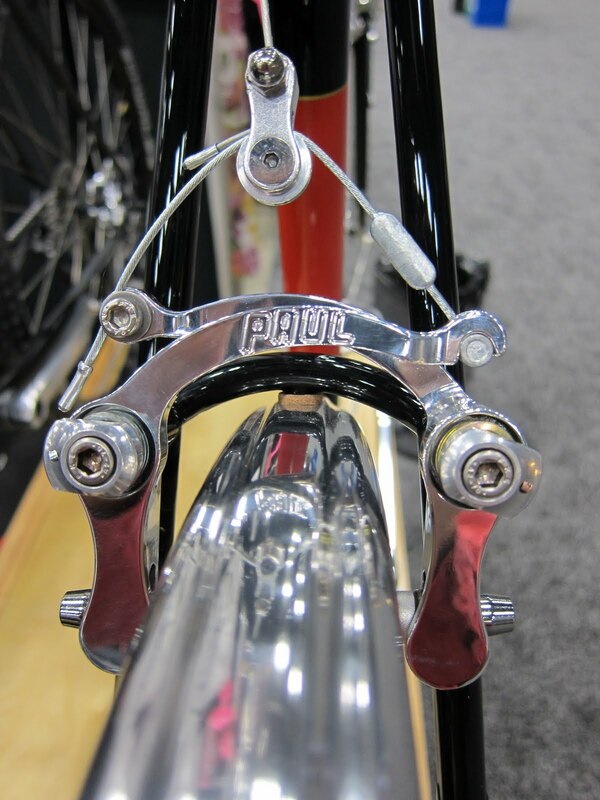 This particular bike, had many cool details, like this tiny “wire” cable holder which I believe is custom. The front rack is also custom. 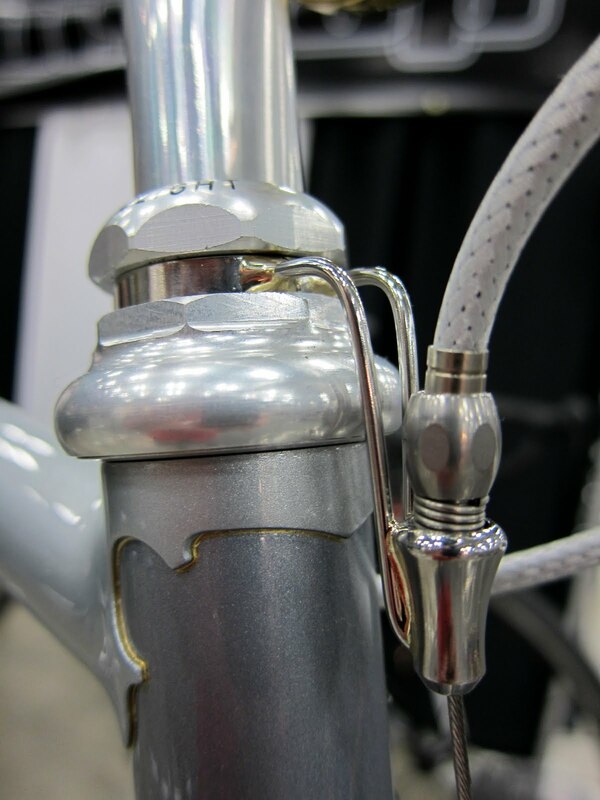 The brazing and finish work were beautiful. 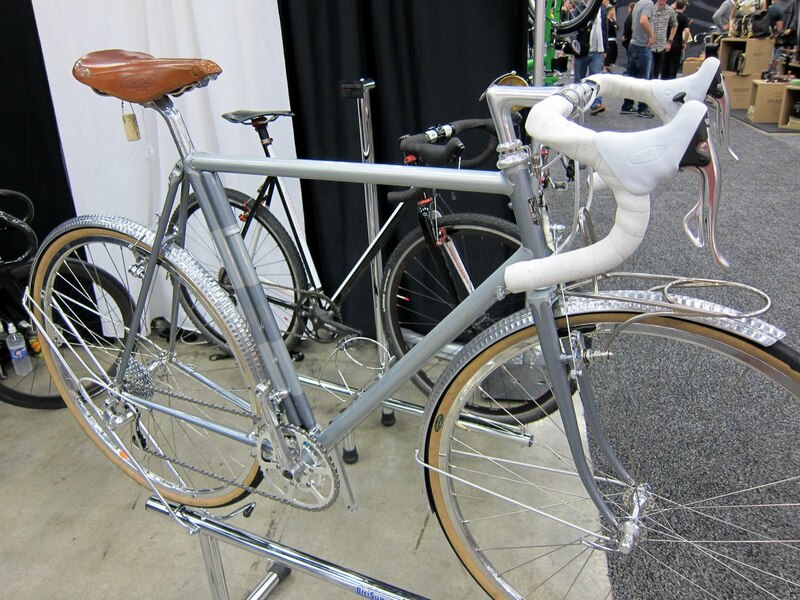 I’m not a brifter or white tape guy, but the two-tone grey paint spoke to me. This guy had several amazingly clean bikes. 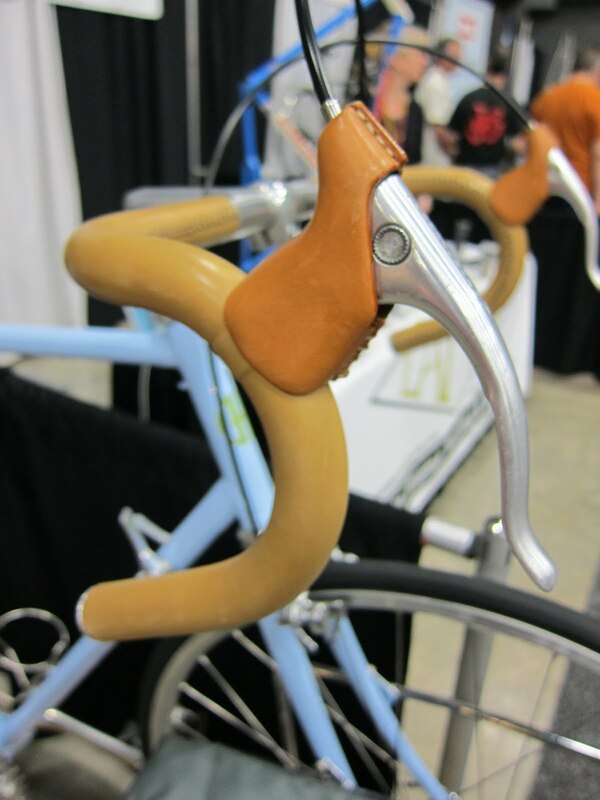 I don’t know how practical leather brake hoods are, but the craftsmanship was impressive. 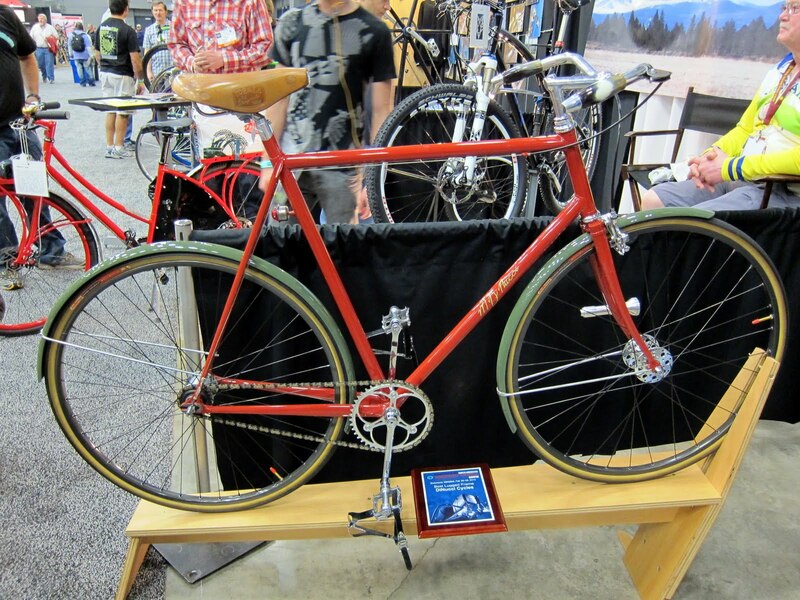 Unless his complimentary brother here is the perfect retro urban bike. 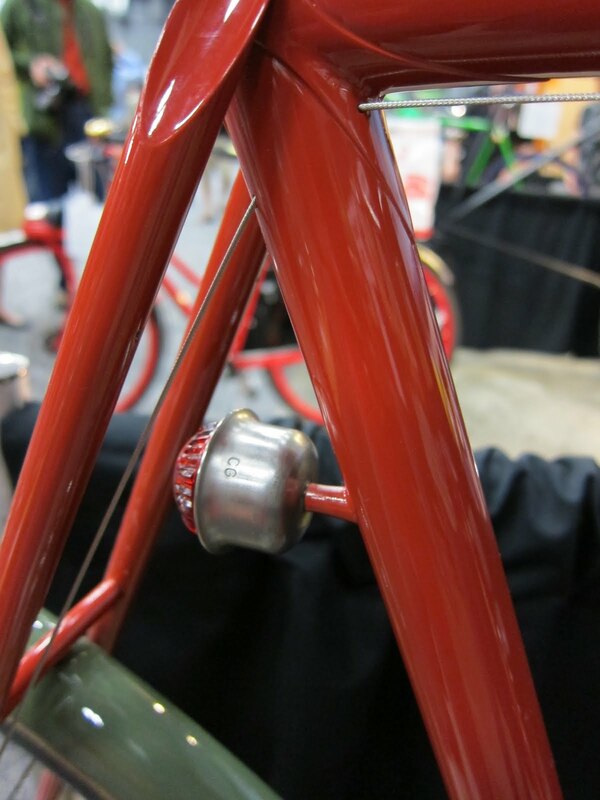 Notice the amazingly clean cable routing through the seat tube. I don’t know if it works well, but it looked awesome. DiNucci’s lug thinning was so beautiful, I spent a lot of time admiring these two machines. He just has a way of bringing the retro look to his work that I found delightful. 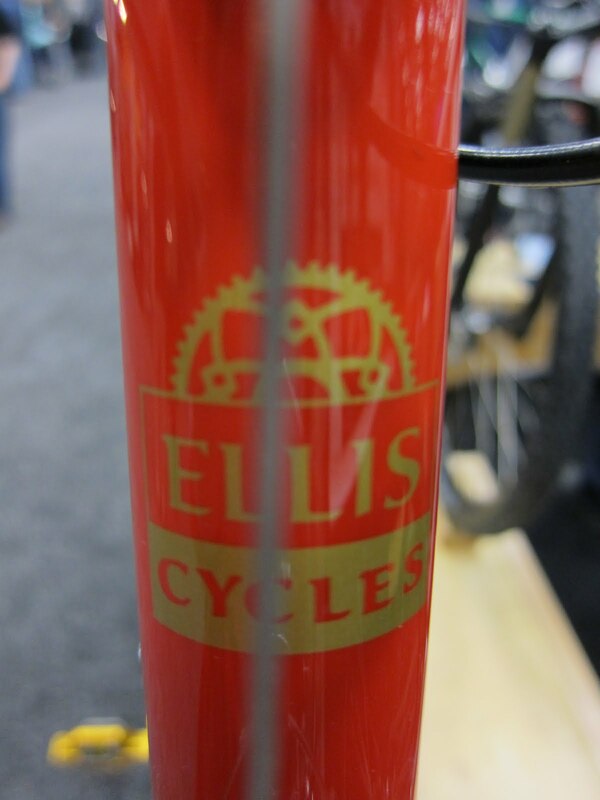 Doug, of MnBicycleCommuter fame and proud Ellis owner, offered strong encouragement to visit Dave Wages of Ellis Cycles. I had heard that Dave did great work, and that he was the “Best in Show” winner last year, so I was eager to drop by his booth. And what I found was doubly impressive. Dave was a fantastically nice guy (just as Doug had said), and every frame he had in the booth was jaw-dropping gorgeous. The black and red bike above seemed like the perfect blend of beauty and function. It had every detail just right to be an ideal long distance machine. As I type this, I see this bike won this year’s Best Road Bike Award. But since it was just my size, I give it the prestigious Pondero’s 2011 Best in Show Award. I’ve got a few more philosophical observations and ponderings that didn’t quite fit here. 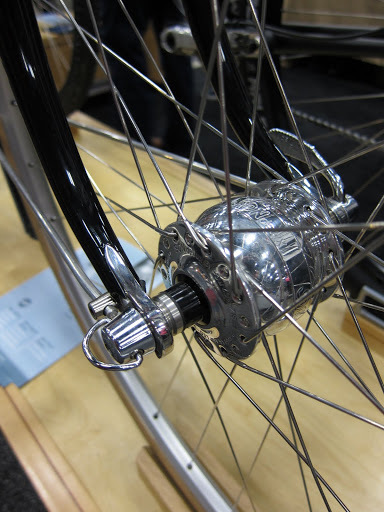 So I’ll probably throw up one more NAHBS post soon to wrap things up. 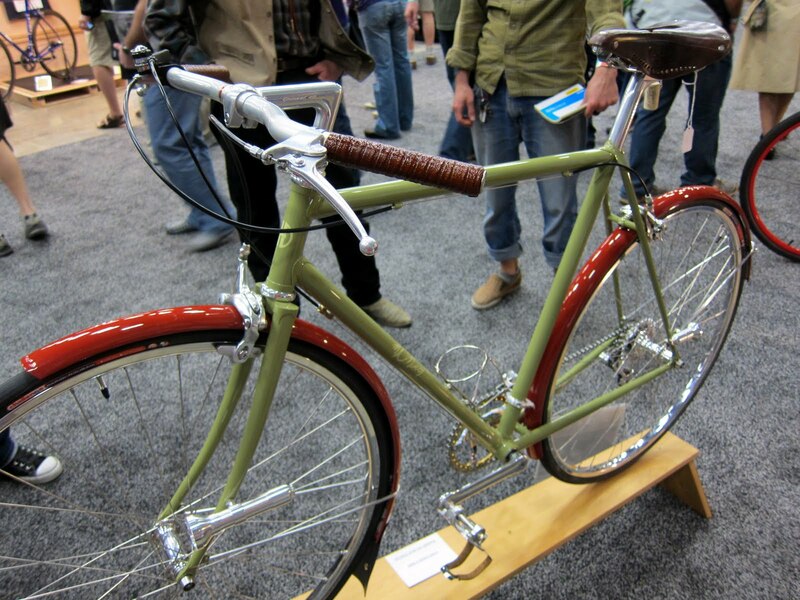 The Green DiNucci went on to win 'Best of Show'. Mark was one of the earliest builders in the USA, starting the same year as Richard Sachs and has 40 years of building experience behind him, not to mention an obsession with seeking zen like simplicity in his execution. Hey, thanks for the update, and the background information. That was probably my second favorite. Your description, "obsession with seeking zen like simplicity in his execution" is perfect. He delivered! Gorgeous bikes all around. It must have been tough choosing your favorites. Those leather brake hoods do look amazing! Hey, Dan. All I can say is CONGRATS! 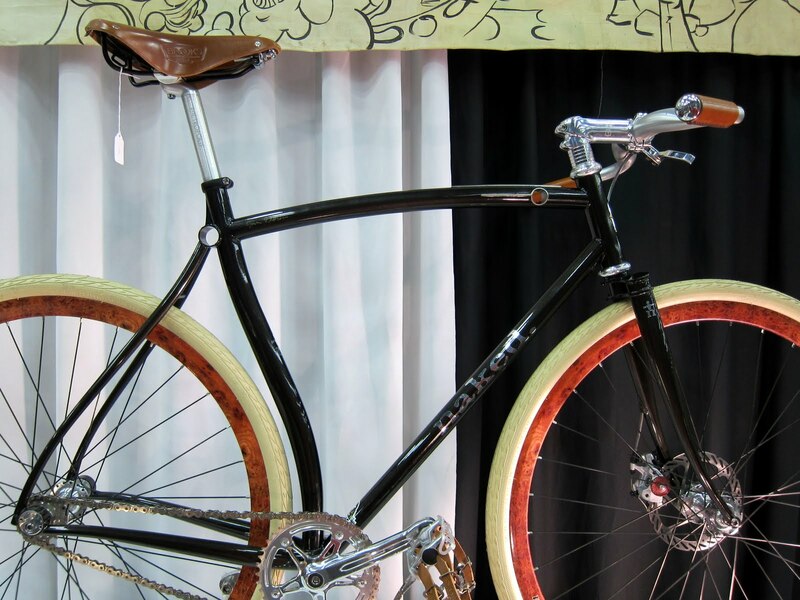 That is one fine bicycle! I was not aware of Bishop, but I certainly am now. I enjoyed my brief conversation with Chris and his honest enthusiasm. I hope that thing rides as good as it looks, and you treasure it for many years. Leather brake hoods. 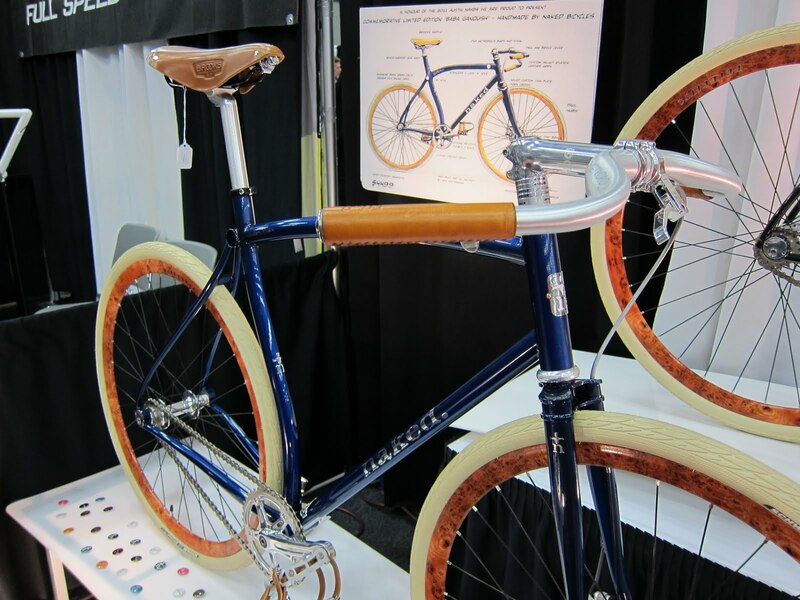 I'm surprised Velo Orange hasn't offered them, but I imagine they will now!I loved the Bishop Bike, but agree something other than white would have worked better, considering the brown saddle and the gumwall tires. The pump was an elegant touch on that bike.